A note from the owners: Opportunity drove us from the East Coast to Los Angeles to Nashville —yes. a full life. However, one evening about 15 years ago, the question arose, “If we are no longer tethered to the virtual workplace if we can settle anywhere on earth, where would it be?” For generations, our families flourished in the northeast — summer gatherings in Maine knotted the generational fabric so it was only natural that our search for a place should begin here, on the rocky coast of Maine. We looked at parcels of land in the mid-coast region. When we first stood on the granite promontory overlooking the Damariscotta River at 8 Merry Island Road, we could envision the unique glass cottage that now shepherds the cove below. We found our place and together we built an uncompromised sanctuary. Now, we invite you to enjoy the wonderment of a sunrise on the Damariscotta, a kingfisher surging from its nest, and an oyster farmer finishing his day of work. Secluded, year-around, contemporary vacation home featuring breathtaking views and 300′ of shoreline access are now available for short-term spring, summer, fall, and winter rentals. 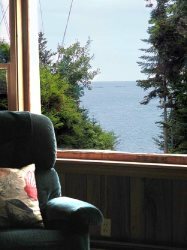 Merry Island Cottage is located on the Damariscotta River 10 miles from Boothbay Harbor, 6 miles from Damariscotta/Newcastle and 11 miles from the village of Wiscasset. Relax in the private, wooded waterfront environment. Experience the daily activities of a working coastal inlet from the expansive cottage windows or the oversized screened porch. Lobster boats, trawlers, sailing vessels, and vacation yachts blend with osprey, blue herons, and wild turkeys to punctuate the coastal landscape. Kayak, swim, fish, sail, motor, paddle or just float in our private saltwater bay. Merry Island Cottage offers 2600 square feet of living space. The open kitchen/dining/living area features 20′ ceilings, large fir crossbeams and a wall of windows. The main level also includes the master bedroom and bath, a laundry/storage space, an extra ½ bath, a large screened sleeping porch and a deck and multiple entrances into the main living areas. The lower level features a full bath, a guest room, a large bunkroom, and a natural wood porch with entrances to each of the lower bedrooms. The double story layout allows for privacy when needed. Ecologically sound and aesthetically pleasing building choices include a gourmet kitchen with green-labeled appliances, the ICF foundation system, concrete floors with radiant heat, and landscaping with native Maine perennials. The Rais wood stove and stainless steel room fans, assure comfort even on the chilliest nights or warmest afternoons. Washer/Dryer, linens provided, all kitchen necessities including lobster pot, outdoor grill, satellite TV, wi-fi internet, outdoor and indoor games, and activities. Unfortunately, we don’t allow pets. We had a fantastic stay at this property-Even during a wind storm that knocked out power! There was plenty of firewood on hand and candles for the unexpected turn of events. The privacy this home offers was fantastic and a short drive into town when we wanted to rejoin the world at large. Great water views and nature hikes nearby. The owner has provided local maps and info on area attractions as well. We actually live nearby in Portland. This is a very welcome getaway from our everyday. This beautifully designed home was perfect for my family. Photographs and artwork adorn the walls and the large windows allow for spectacular views of the sunrise, the river, and fireflies at night. It provided a well-equipped kitchen and clean comfortable common and private spaces. We especially appreciated the access to the outdoors from each bedroom so people could come and go without disturbing the others. We enjoyed serene morning contemplation by the river, seal watching, shoreline exploration, and even ventured out on the river in floats purchased at the local Reny's store. It's location made it easy for us to visit Boothbay Harbor, Damariscotta, and Bristol. It was exactly what we needed to decompress from the hustle and bustle of daily life in the city. We would definitely like to return again. Gorgeous modern house on Damariscotta. Comfortable. Airy. Quiet. We loved the kitchen/cooking set up, the amazing windows onto the water. Easy access to Damariscotta and Booth Bay from River road. Great bedrooms and bathrooms. Great for socializing and for relaxing. Good air flow, ceiling fans in main rooms. Beautiful decks and porches, both screened and open. No other homes in view. Great chairs on rock overlooking water. Our experience was 100% positive. Centrally located, beautiful modern house. Everything as advertised. The owners were very pleasant and good to work with. Highly recommend. Exceeded expectations! I read the reviews beforehand and had high expectations. The house exceeded those. It is situated in a camp- like setting with dense woods, water views, unpaved driveway, etc. The contemporary house is equipped with high-end appliances, walls of windows, and THEE most efficient wood stove I've encountered. 3 small logs took the chill off one evening. It feels like Frank Lloyd Wright meets IKEA. The owners have taken care of all those small details by stocking the house with paper towels, band-aids, shampoo,nail clippers, thermometer, you name it. They recommended a place to rent kayaks and on a moments notice, I had two kayaks delivered. My 2 teenagers spent hours on the river kayaking with seals frolicking nearby while my husband and I enjoyed some wine on the Adirondack chairs taking pictures of them. One evening was spent playing scatagories ( supplied by the owners) after we cooked lobsters from the neighboring vendor. Nary an iPod, iPad, tv or any device was in sight or in use! When I needed to send pics to family, WiFi was readily available. A memorable house, a memorable vacation! Privacy Rating 4/5: Very private, secluded location, lots of protection from trees, cannot see any neighbors from the house, not close to any roads, long driveway. Bathrooms: (1) half bathroom with sink & toilet on the main level, (1) Full en-suite bathroom with sink & toilet on the main level, and (1) Full bathroom on the lower level.